I’ve been working on this post for a while. Not only is this one of my most requested posts and emailed questions, it’s something I’ve personally been working on. Now that I’m in my mid-twenties, I’m way more interested in selecting pieces for my closet that I can wear year round for many years to come. I’ve also been paring down what I own and only keeping the things that I wear frequently and feel confident, comfortable, and chic in. This isn’t to say I wouldn’t splurge on a colorful dress or something fun, but these are the things that I gravitate towards on a daily basis. They’re pieces that you can mix and match and create outfits that you feel and look great in. There are grown up pieces that can work in a professional setting, pieces that are great for comfort, and pieces for everyday great looks. 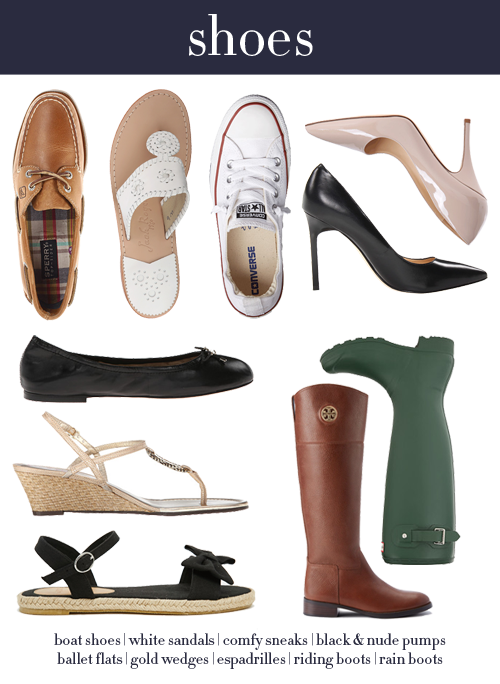 I think if you snapped your fingers and were given a closet filled with the following, you wouldn’t have to shop again! A couple of notes before I go into a deep dive. – This should be used as a guide and not as a bible. I used a lot of things from J. Crew because that’s where I personally tend to get a lot of my basics… and it’s a retailer that shoots their products on a blank background. 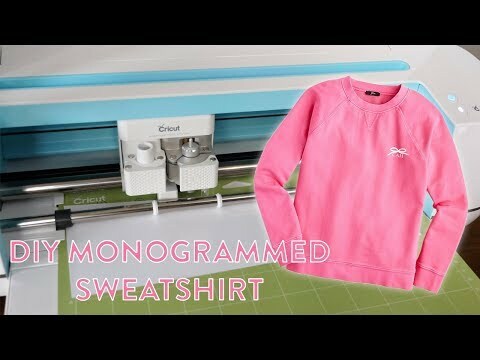 – When building out your wardrobe, it’s first helpful to see what you’re working with. Take everything out of your closet, and sort your clothes based on what you have. Create a donate pile, a pile to toss, a pile to tailor, and a pile of what you want to keep. Then you can inventory what you have versus what you need. – I also recommend not rushing into anything. You don’t need everything all at once. Keep in mind that it will take time! You don’t have to (and shouldn’t) run out and buy everything all at once. I recommend setting a budget so that you know what you are and aren’t willing to splurge on. For example, you may be willing to splurge on handbags since you use them every day, but want to save on your t-shirts. – If you’re looking to build a wardrobe on a budget, I recommend… Old Navy, Joe Fresh, Gap, ASOS, Uniqlo, and Loft. 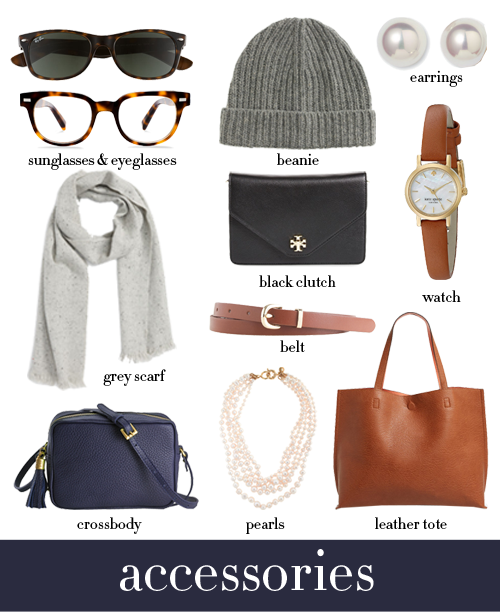 – I based this guide on the colors I wear most often: black, navy, and grey… with brown leather touches. You may find that you’re more of a chic all-black kind of girl or maybe you never wear black. You can tweak the colors to fit your personal preferences. On any given day, I’m almost guaranteed to be wearing one of these tops… or a combination. I love a good grey sweater (I have too many!) and a button up can be worn alone or with a sweater. I didn’t add it in the collage, but I also think it’s worth stocking up on great basic tees– definitely in white, navy, and grey– every year. I wash mine so frequently that they tend to lose their shape and color after a year. Bottoms is pretty simple. 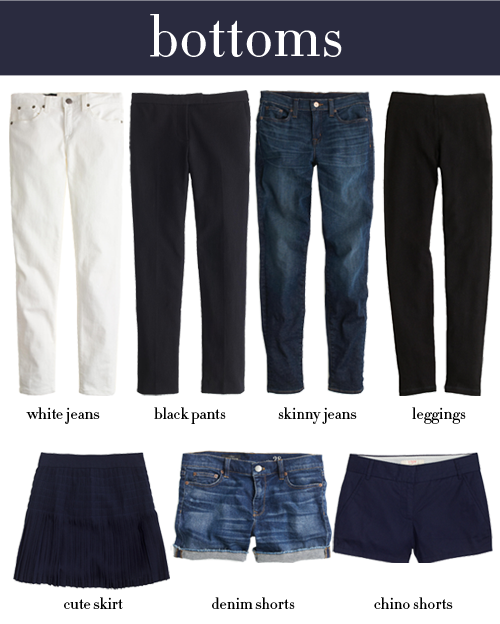 With this group of bottoms, you can create a bunch of simply chic outfits. 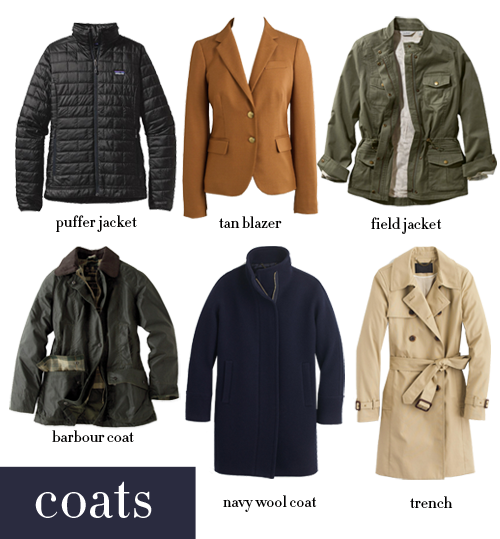 For outerwear, I tried to be thoughtful about what I like to wear throughout the year and what coats I feel the very best in. I included both a Barbour and a field jacket, but you could definitely eliminate one or both if you’re not feeling it. 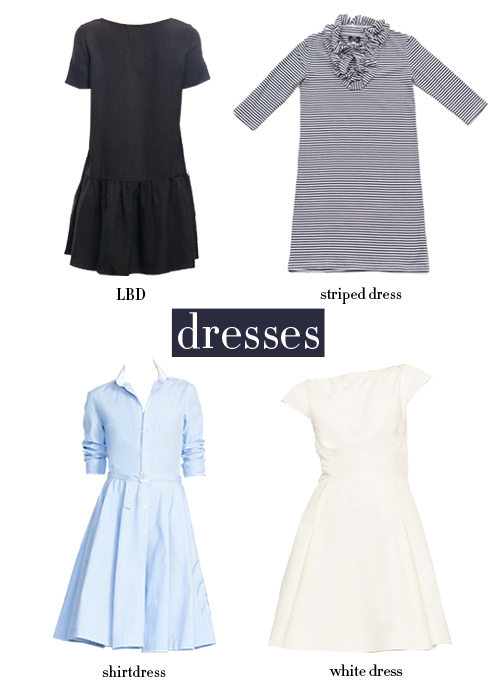 As far as dresses go, this would be the very bare bones of what I’d have in my closet. I tend to buy more dresses than anything, especially during the summer months when it’s the easiest thing to throw on. I think the LBD speaks for itself, but if you don’t already own a shirtdress, I highly recommend investing in one. They’re the most comfortable and easiest dress to wear while still feeling relaxed yet chic. I definitely belong to the “less is more” camp for accessories. From time to time I’ll find a trend that I may like, but I always fall back on the same classic pieces that are tried and true. As with the dresses, I can go a little crazy with shoes. But if I was just starting out my shoe wardrobe or moving somewhere where I was forced to limit the number of shoes I brought, this is what I’d be left with. Did I miss anything that’s a must have in your wardrobe? YESSSS! This could not be more perfect! Especially as I get into my 20s *yikes* I need to update my wardrobe to more professional-looking clothes. A staple in my closet is the perfect pair of leather brown loafers! Thanks for sharing this comprehensive guide Carly, this is so helpful! I definitely agree in the importance of investing quality pieces you'll get a lot of wear from. 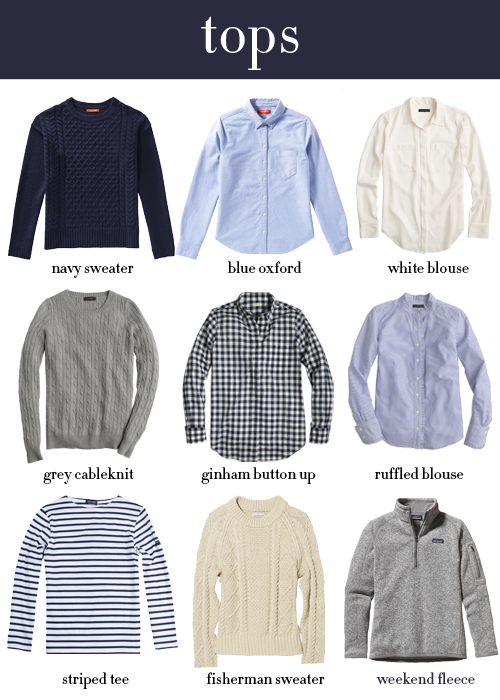 This post is making me want to hit J.Crew ASAP!! Thanks for sharing, love the way you laid this out! 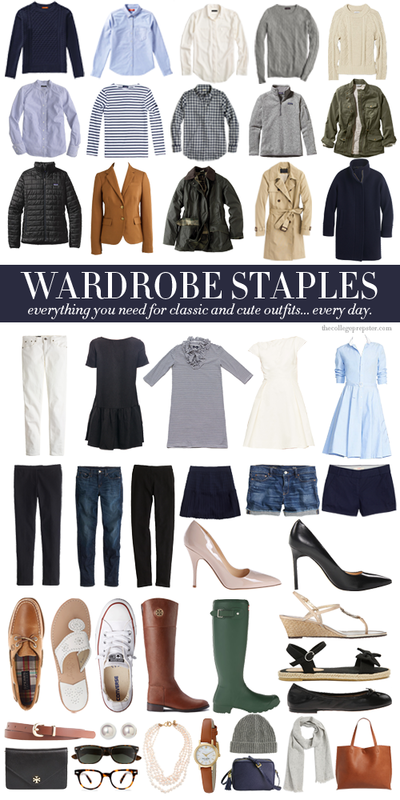 I have been working on my closet staples, and I do have a good amount of these! I think sitting down and thinking about the basics helps keep my shopping focused! I loved all your choices! They make me wish I was 20-30 years younger. I would like to see a selection for ladies over 50, and a separate collection for people who live in the south. Coming from the north, your collection would be great for year round there, but here in Florida, I wear shorts or capris close to 10 months out of the year. What fun to create a minimalist wardrobe for those two categories! I'd love to see them. Thank you for sharing your great ideas! This is great Carly!! Comprehensive without being overwhelming, awesome job! This will be one of those posts I can go back to for inspo on whether I need something or not! This guide has a lot of great staples. I'm assuming you created it with a student in mind… plenty of choices for leisure, outings, dinners, etc, but there are few work appropriate outfits that can be created here. You need more than one pair of slacks to carry you Monday-Friday in an office! I would round this collection out with a tan or black pencil skirt, a solid wrap dress, a basic cardigan, and at least one more pair of work-appropriate pants. I thought office wear would have to be its own category altogether… and so many people have different environments they work in (from professional to casual) that I didn't think I could cover it appropriately! Understood! Anyway, I think these are some great, versatile picks. I loved this list! The color scheme is right on my with my entire closet! (you know you have a problem when you already own all of those pairs of shoes! #guilty) Loved this post! Thanks for sharing. I love your classic style. I really want to put more effort into what I'm wearing and what my style is. This is such a great post and so spot on! This is amazing, and perfect timing! I spent last weekend going through all of my clothes and donated a car load. I have a few boxes to drop at Crossroads to sell this weekend. The next step is building a classic & timeless wardrobe 🙂 Thanks! YES FINALLY a wardrobe essentials from someone who knows what they’re talking about! I am so happy I just stumbled across this- I am in the middle of a fashion crisis and this is exactly what I need. I have been splurging on things I don’t wear more than once and constantly buying cheap clothes I’m not the happiest with… Now I have a list to take along with me shopping! Thank you so much! !